Many returning citizens wish to start or grow a small business. Yet for those who have no or impaired credit histories following incarceration, the lack of available responsible credit building financial products makes them more susceptible to the ubiquitous and predatory marketing practices of payday lenders and other fringe creditors. This perpetuates opportunities for returning citizens to fall into cycles of financial instability. 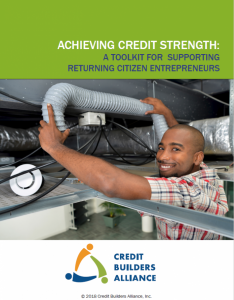 In recognition of these challenges, Credit Builders Alliance released Achieving Credit Strength: A Toolkit for Supporting Returning Citizen Entrepreneurs. This toolkit provides financial capability and reentry practitioners with tools and resources for helping returning citizens to build strong credit, and strong businesses. In conjunction with the release of this toolkit, in 2018 CBA hosted three convenings in partnership with the Cuyahoga County Office of Reentry, The Fountain Fund, and Heartland Alliance, all community leaders and experts in this space. Participants had the opportunity to interact with the toolkit and national experts discussing credit building, entrepreneurship and ways to support the financial stability of returning citizens pre- and post-incarceration. While incarcerated, many incur large debts due to court fees, fines, public defender fees, and the like. Adding to this burden are previous debt obligations, incurred prior to incarceration. However, making timely payments on debt commitments while incarcerated may be challenging (or near impossible)—due to a lack of income and lack of family members or friends who are willing and able to assist in keeping the debt current. Consequently, most of these debts accumulate late payment fees and eventually end up in default and sent to collections. Upon release, many financial institutions will not lend to returning citizens, or those who are justice exposed, because of their poor credit history and resultant low credit score or lack of a credit score at all. Further complicating the situation is the fact that many returning citizens have been victims of identity theft while incarcerated. Credit cards and cell phone accounts in their name may have been stolen and used fraudulently by other people. Once released, the returning citizens then have identity theft issues to deal with. In cases of ID theft where the perpetrator is known, which is the case for the majority of identity theft cases, a police report is often required to address the problem. However, many returning citizens are reluctant to report to the authorities on someone that they know. The ability to access credit is vital, since many returning citizens are not able to find jobs due to exclusionary hiring policies, which are meant to screen them out. So, many are drawn to entrepreneurship as an income generating path, which is not dependent upon being hired by others. However, starting a small business requires capital. If returning citizens are unable to qualify for start-up loans, then this avenue is also blocked. Helping Organizations Move People from Poverty to Prosperity Through Credit Building!